I have a small edible garden grown on composted soil with mint, lettuces, green onions, tomatoes, broccoli, and kale. I see your article about guano being a good fertilizer. Is this the case for edible gardens? We have just found a bat roosting nest above our garden. Apparently, they urinate/defecate when exiting their nest. 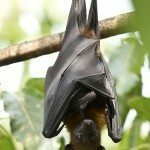 Dont bats carry diseases and their feces causes health issues in humans? Can my edible garden be safe? 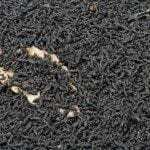 I don't recommend using any guano that is not composted or heat treated. I do, however, notice what looks like a spot of powdery mildew on one of your crops. This is usually caused by overly humid or moist conditions either around the plant or in the soil. I would recommend spraying with neem oil, and washing thoroughly before eating just to be safe.